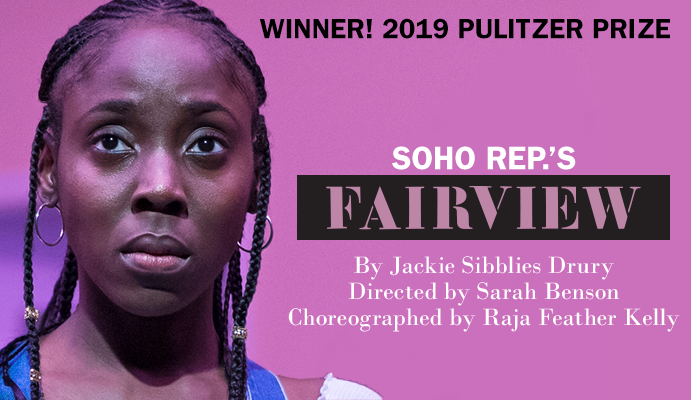 Jackie Sibblies Drury wins the 2019 Susan Smith Blackburn Prize for Fairview! This prize recognizes women from around the world who have written works of outstanding quality for the English-speaking theatre. The judges for the 2019 prize were Michael Buffong, Maria Manuela Goyanes, Marianne Elliott, Jennifer Haley, Tamsin Greig, and Marin Ireland. Past winners include Lynn Nottage, Annie Baker, Sarah Ruhl, Paula Vogel, Wendy Wasserstein, and Caryl Churchill. Read more from The New York Times. Direct from sold-out runs at Soho Rep. (extended three times) and Berkeley Repertory Theatre, TFANA brings Soho Rep.’s Fairview to Polonsky Shakespeare Center, extending its 2018-19 Season. TFANA was thrilled to present Soho Rep.’s An Octoroon by Branden Jacobs-Jenkins in 2015 and is pleased to again partner with Soho Rep. to bring Jackie Sibblies Drury’s acclaimed play to Brooklyn. Additional participants and topics to be announced shortly. Jackie Sibblies Drury (playwright) is a Brooklyn-based playwright. Her plays include We Are Proud to Present a Presentation About the Herero of Namibia, Formerly Known as South West Africa, From the German Sudwestafrika, Between the Years 1884-1915; Really; and Social Creatures. Sibblies Drury’s plays have been presented by New York City Players and Abrons Arts Center, Soho Rep., Victory Gardens, Trinity Rep, Matrix Theatre, Woolly Mammoth, Undermain Theatre, InterAct Theatre, Actors Theatre of Louisville, Available Light, Company One and The Bush Theatre in London, among others. Her work has been developed at Sundance, The Ground Floor at Berkeley Rep, Manhattan Theatre Club, Ars Nova, A.C.T., the Soho Rep. Writer/Director Lab, New York Theatre Workshop, PRELUDE.11&14, The Civilians, The Bushwick Starr, The LARK, Magic Theatre, Bay Area Playwrights Festival and The MacDowell Colony. Sibblies Drury was a dramaturg for Futurity by César Alvarez and The Lisps; Zero Cost House by Pig Iron Theatre Company and Toshiki Okada; and The Garden by Nichole Canuso Dance Company. She received a 2015 Windham-Campbell Literary Prize in Drama, a 2012-2013 Van Lier Fellowship at New Dramatists, and was the inaugural recipient of the 2012-2014 Jerome Fellowship at The LARK. She is a NYTW Usual Suspect and a 2015 United States Artists Gracie Fellow. *If you have subscriber questions, please email tickets@tfana.org or call the subscriber hotline at 212-229-2819 x10.